If they heed it in time. Any journey through the runes, including this series of 24 runic affirmations, is nothing if not transformative. 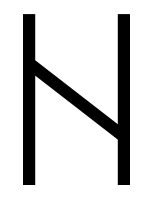 It’s been nearly three months since my last post, and the time between has been full of Naudiz’s energy, the second rune of the second aett (“rune family”) in the Elder Futhark. In my case hardship took the form of an employer who, having recently experienced a great personal tragedy, proceeded to make the lives of those working for him very difficult. As I was already splitting my time between two jobs – this one, which provided for me financially and another, which doesn’t pay as well – I decided to resign from the former and focus fully on the latter. Looking back over the last few months, I realize this was the only viable choice. I certainly could have remained without financial worry by keeping the old job, but would’ve been miserable had I continued subjecting myself to a boss incapable of separating his personal life from work. What good is money if it comes at the cost of happiness, and what good is a job if it doesn’t allow me to contribute in a satisfying way? Though the choice to focus fully on the second job (which is really a career) will bring short-term financial hardship, it’s one that has already brought greater freedom and joy. Given time and hard work, it also has the potential to create more income than the job I’ve left. And so the meaning of Naudiz becomes clear: hardship as something to be endured, with “help and healing” for those who “heed it” and persevere. Said another way, we can choose to see any unpleasant situation life presents as a chance to create something we love. Of course we can also choose to do the opposite, and many do. For some, playing the victim and assigning blame instead of taking responsibility for their happiness is the safer, more predictable bet. After the last few months of unhappiness, I’m done with “safe” and am ready to unfold into a joyful new world of unknowns. I peacefully and lovingly release situations and relationships that are not for my higher good. I view every situation as an opportunity to grow stronger and more joyful. These affirmations by Orin and Sanaya Roman appear in the book Living with Joy. If they don’t ring true for you as they’re written above, feel free to change them! The words don’t do the work on their own…it’s words + repetition + intent and emotional connection that make affirmations such powerful catalysts for positive change. Create ones that feel good and reflect who you are. Click here to see other affirmations in this series. I’ve been a runology student for 20 years. 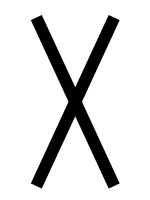 See the About page or click here to learn more about my work with the runes. Do you feel like a storm is brewing? If so, get out the candles, stoke the fire, and prepare to wait it out. 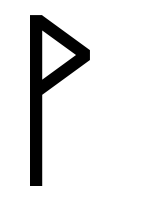 The first rune of the second aett (or rune “family”) in the Elder Futhark is all about challenges that delay and disrupt your plans. In situations like these your choices are usually few, but clear. Do you face the storm with courage, then pick up the pieces and rebuild after it has passed? Or do you deny the storm is raging around you, then stare with disbelief at the damage it leaves behind? Worse, do you spend your valuable time and energy demanding the Universe “make things the way they were before,” instead of moving forward? About these affirmations: if the words presented above don’t ring true for you, change them! The words don’t do the work on their own…it’s words + repetition + intent and emotional connection that make affirmations such powerful catalysts for positive change. Feel free to create ones that feel good and reflect who you are. Being happy isn’t about what or who you have in your life, it’s about deciding to have joy now, and settling for nothing less. Many of us spend immense time and energy chasing things and people we think will eventually make us happy, meanwhile robbing ourselves of joy in the present. The typical list titled, “what I need to be happy” is usually long: the “perfect” partner, family, career, house, car, and on and on. What’s even more unpleasant than the burden of these unrealistic expectations is the inevitable realization that, regardless of what we do or accumulate, perfection does not exist. You know that feeling of satisfaction that comes from successfully completing a project you’ve invested a lot of time and energy in? And how that feeling is colored with joy when you stand back and look at what you’ve created? These feelings are the essence of Wunjo, and describe one road to honest and sustainable happiness – a road that begins inside you. I am living my higher purpose as I do what brings me joy. I am joyful right now. About these affirmations: if the words presented above don’t ring true for you, change them! The words don’t do the work on their own…it’s words + repetition + personal intent and emotional connection that make affirmations such powerful catalysts for positive change. Feel free to create ones that feel good and reflect who you are. Who are devoid of aught else. 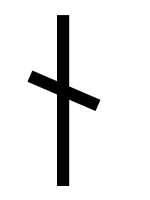 The profound is often cloaked in simplicity, and so it is with one aspect of Gebo: spiritual generosity. Gebo’s poem calls us to share the gifts we’ve been given. The first step is recognizing and claiming our unique talents and abilities; the second is sharing them in ways that support everyone’s highest good (including our own). While it’s true that everyone you meet may not want your gifts, a kind smile or a compassionate word, you are not responsible for anyone’s choices but your own. You have come here to contribute in a special way, and allowing anyone to dowse your light with negativity prevents you from experiencing the peace, joy, and freedom you deserve. Consider as well that it does not support your highest good to continually give to anyone who does not value your time and energy. Share your light because it feels good to do so, and learn to walk away from those who can’t or won’t see it. By courageously using your uniqueness to make the world better, regardless of doubt or rejection, you help reassure others it’s alright to do the same. For the highest good of all, I claim my uniqueness and share my gifts with everyone I meet. Awareness of my higher purpose and the courage to act on it expands every day. About this affirmation: if the words presented above don’t ring true for you, change them! The words don’t do the work on their own…it’s words + repetition + personal intent and emotional connection that make affirmations such powerful catalysts for positive change. Feel free to create ones that feel good and reflect who you are. Understanding has no value unless accompanied by action. Where Aethlings rest themselves within. Kenaz means “torch.” What does a torch do, and how? It lights the way, with fire. If you’ve camped outdoors, you know the value of a flashlight; if you’ve sat in front of a fire on a cold winter night, you know how comforting it can be. 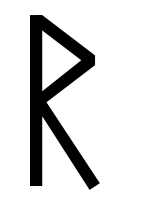 These are the essence of this rune. Many cultures have stories to explain the origin of fire. Greek mythology holds that Prometheus stole it from the gods for humankind. North America’s Original People often credit coyote or raven with doing the same. How ever we explain its beginnings, both literal fire (which provides warmth and comfort) as well as figurative fire (enlightenment and knowledge) are central to our existence. Like any tool however, neither has value unless used. Once the path is clear before you, do you move forward? Or do you stand motionless, fretting and regretting until your torch burns out? I listen to my wise and loving inner self, and consistently take actions that support my highest good. About this affirmation: if the words presented above don’t ring true for you, change them! For example, some may want to replace “my wise and loving inner self” with the name they use for their Higher Power (God, Jesus, Goddess, Buddha, etc.). The words don’t do the work on their own…it’s words + repetition + personal intent and emotional connection that make affirmations such powerful catalysts for positive change. Feel free to create one that feels good and reflects who you are. Raido’s deeper meaning is deceptively simple: life is a continual series of cycles. When you find yourself journeying down a difficult road, uncertain what the next turn will bring, take a deep breath and keep moving forward. All will eventually become clear. Around some corner ahead is a place of comfort – a place where you can sit and reflect on the challenge you’re facing now and draw wisdom from it. Eventually you’ll set out again to face another challenge, learn another lesson, and continue your growth. I am aware of my personal cycles, and give myself permission to honor them. I move forward when inspired to, and rest and reflect when I need to. A note about this affirmation: if the words presented don’t ring true for you, change them! Make it something that feels good and reflects who you are. The words don’t do the work on their own…it’s words + repetition + personal intent and emotional connection that make affirmations such powerful catalysts for positive growth. We have a lamp inside us. The oil of that lamp is our breathing, our steps, and our peaceful smile. Our practice is to light up the lamp. What is a Solitary Eclectic Wiccan? Under a Violet Sun by Jerome M. is licensed under a Creative Commons Attribution-Noncommercial-No Derivative Works 3.0 United States License. Based on a work at violetsun.wordpress.com.